Just look at that sweet carbon fiber bezel. 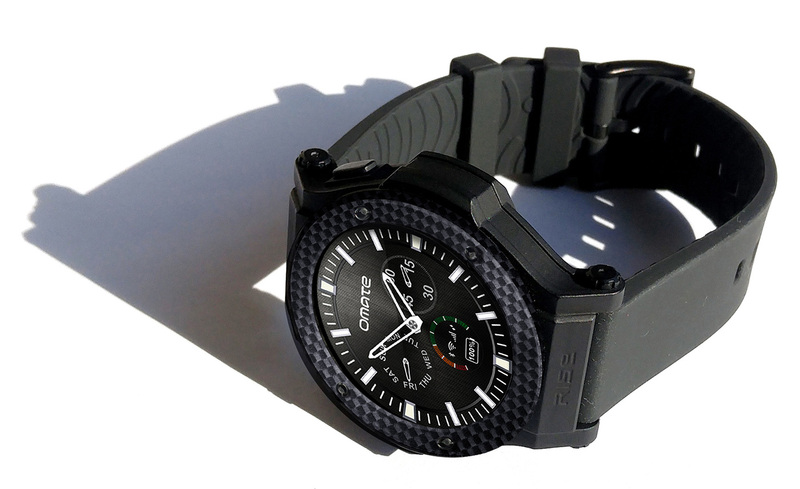 Omate probably isn't the first brand that comes to mind when you think of smartwatches, but the truth is it was one of the first to launch a 3G-enabled smartwatch. It's been over two years since then but such devices have yet to fully take off, not to mention that LG has recently canned its latest LTE watch. But that's good news for Omate who is launching the Rise, a $200 fully circular smartwatch, via Indiegogo on December 7th. Much like its predecessor, the Rise runs on full Android 5.1 (customized with Omate's new OUI 4.0) instead of Android Wear, meaning you can side load any regular Android app -- including all the missing Google Play services -- onto it. But of course, you'll have to get used to poking around on that 1.3-inch, 360 x 360 round LCD. Additionally, the Rise also works as a notification watch with phones running on either iOS 9 or Android 4.4 and above. This largely plastic smartwatch runs on MediaTek's MT2601 chipset, which features a low-power dual-core 1.2 GHz Cortex-A7 CPU, a Mali-400 GPU, 512MB of RAM and 4GB of storage space. On the cellular side, this time you get 3G HSPA connectivity on both 1900 MHz and 2100 MHz bands, meaning it'll work on major networks in the US and Canada, which were the regions that Omate's previous devices couldn't support. To get your Rise connected to 3G, simply untwist the bottom cap and pop a Micro SIM card inside, which is in some ways more convenient and more flexible than activating an electronic SIM card à la Samsung Gear S2. Other notable features include GPS radio, gyroscope, accelerometer, microphone, speaker, Bluetooth 4.1 with Low Energy, sapphire coating on the glass and swappable 22mm strap. According to Omate CEO Laurent Le Pen, the 580 mAh battery should provide two days of normal usage and up to five days on standby -- both of which sound about right at this day and age. For the sake of added protection and also a cooler look, the Rise features a round carbon fiber bezel which doesn't come cheap. The polycarbonate body itself is also quite impressive, as it claims to provide water resistance of up to 10 meters (Le Pen says this is the spec provided by the watch factory that supplies this chassis, and relevant tests will be performed with the final units). Eagle-eyed readers may have already spotted the missing heart rate sensor on the Rise. Le Pen reasoned that there aren't many accurate sensors available for such a small form factor, so he recommends using an external Bluetooth LE chest belt instead. This is actually what he's throwing in for the first 1,000 units sold in his Indiegogo campaign, which is launching at 10am ET on December 7th. The first 500 pieces will cost just $199 a piece, then the next 500 for $209 each and then however many for $219 each (but no chest belt included). Interestingly, this campaign will only be live for 48 hours, so you'll have to act quick for a March 2016 delivery.